WHENEVER I AM asked to give advice on making good decisions I share the words of a 19 year old convict that I once wrote letters to. He advised that I should listen to the advice of those older then me because they have been where I have (and often where I do not want to go); and that when something does not feel right I should run as fast as my feet can carry me. I have recalled that advice countless times. Sometimes I have paid heed to it but many times I have rushed head long into something new or bad or beautiful, without a second thought. I tend to be an extremist. My decision making principles reflect this. To make decisions I ask myself one question: what will I regret not doing the most? Then if I hesitate, I whisper my motto or maybe, my war cry: “Do the thing you fear!” In my extremist mind, I figure any decision can be made well by following these two simple standards and remembering the convict’s words. I am not really brave so I need to remind myself that I am capable of doing the things that I fear. My cowardice requires a tap on the shoulder and a reminder that I do not want to live my life alone in a dark corner reading a book; that I want to live with abandon and deeply. I want to be present and alive; able to let things go when they are dead and provide space for the living things to grow. I do not want to regret the things I have not done nor look with remorse on things I have done. 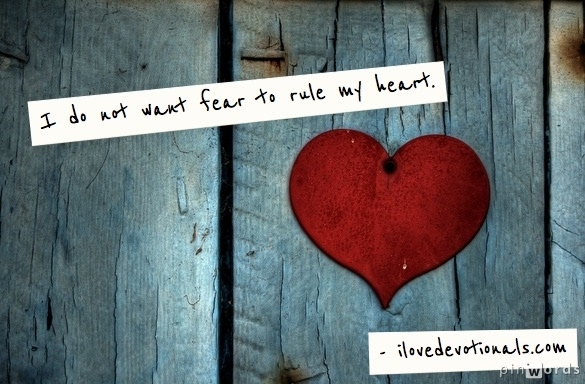 And I do not want fear to rule my heart. What if you lived your life secure in the love and power of God? Does fear stop you from being the person God created you to be?